Dr. Martin Luther King Jr. was a strong believer in service to others and to our nation. That is why every January, in honor of his birthday, hundreds of thousands of Americans come together for a National Day of Service to recognize Dr. King’s life and legacy. As public servants, Federal employees already know the power of working for others. The MLK Day of Service gives us an opportunity to come together with family, friends, and neighbors to give something back to our communities and to those less fortunate than we are. Every day, I see firsthand the incredible generosity of Federal employees. Every summer, they give hundreds of thousands of pounds of canned goods and other non-perishable items to food pantries at times when it’s needed most. And they donate millions of dollars to charities through the annual Combined Federal Campaign. So I know service to others is hardly a difficult sell to our Federal family. That is why I hope many of you will find some way to volunteer in your community on Monday, January 19. Visit www.mlkday.gov to find a project that interests you or to promote your own. Opportunities in communities all across the country range from tutoring students and mentoring at-risk youth to working to protect the environment to assisting veterans and the military. I know that everyone can find a service project that matches his or her interests, time, and abilities. By putting the core American principles of citizenship and service into action and by addressing local challenges, together we can help make our country a better place. I hope that the MLK Day of Service can be the spark that leads people to get involved in their communities all year long. During the past year, more than 1-in-4 Americans did volunteer work. Altogether, 62.6 million Americans gave nearly 7.7 billion hours of their time, which represented an estimated economic value of $173 billion. That’s incredibly powerful. Become a part of that movement. Take the MLK Day Challenge and pledge to serve not only one day, but throughout the entire year by visiting www.serve.gov. “Everyone can be great because everyone can serve,” Dr. King said of the value of giving back. Help us to continue to celebrate that legacy. Even one day of community service can make a difference. As the first Latina Director of the U.S. Office of Personnel Management, one of my highest priorities is to recruit a diverse Federal workforce. 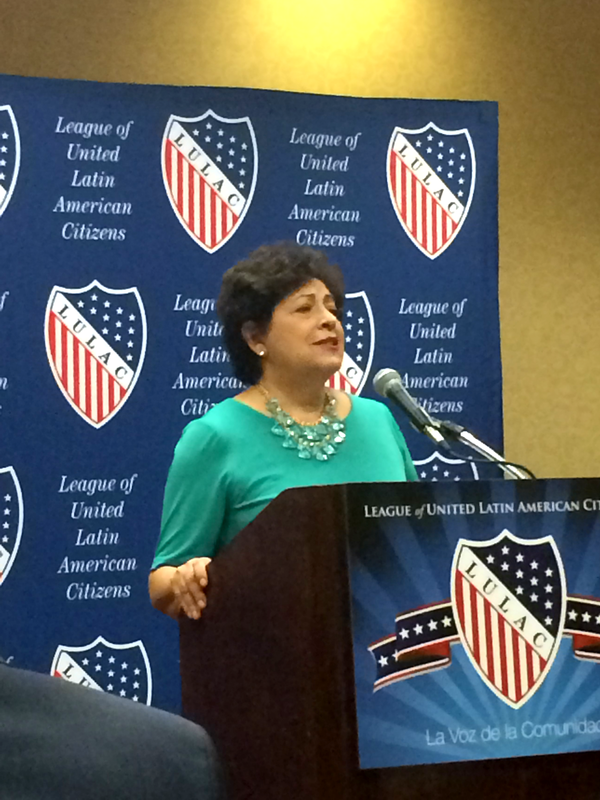 As part of that effort, last week I attended the League of United Latin American Citizens’ annual conference. LULAC is the oldest and largest Latino civil rights organization in the United States. For 85 years, it has fought for civil rights, education rights, legal rights, housing rights, and employment rights. LULAC shares OPM’s goal of promoting a diverse and inclusive workplace. We both know how important it is to have a government that looks like and truly represents the people we serve. Americans benefit from the talent, the wisdom, the experience, and the insights of people from every community in our country. We do a lot of great work with organizations like LULAC. Along with other Federal agencies, OPM is a partner in its Federal Training Institute, which helps to train and mentor the next generation of Latino leaders. As part of the President’s Management Agenda, OPM is placing a renewed emphasis on leadership pipelines. We want to ensure that all groups, including Latinos, are fully represented in the workplace. We are working on an onboarding program to make sure that new Senior Executive Service members have the support and coaching they need, not only when they first begin their assignment, but throughout their tenure. And we are focusing on mentoring. Connecting with leaders in our own communities can give us the help and direction we need. We all need mentors and should strive to be mentors to others. The National Council of La Raza is another leader in the Latino community, and I look forward to speaking at their annual conference in Los Angeles next week. While I’m there, I will also meet with Latino students at several colleges, sharing with them what the Federal government’s employment needs are and asking what would entice them to consider a career in Federal service. When I visit with these organizations and their members, I get the chance to do something I can’t do anywhere else: Hear firsthand the perspectives I need to make our strategies the best they can possibly be. My commitment to a diverse and inclusive Federal workforce is unshakable. Together, we can make sure Latinos are represented at every level of Federal service, especially at every decision-making table. I have some exciting news. A week from today I will be on the field at Nationals Park. And you can be too. On Tuesday, May 6th, the Washington Nationals will help us celebrate Public Service Recognition Week (PSRW) by hosting “Federal Employee Appreciation Night,” and they’ve invited me to throw out the first pitch. And the best part is that I’m bringing five Federal employees on to the field with me. This week and next, use hashtag #FEDSpirit on Twitter, Instagram, and Facebook to publicly recognize a Federal employee who represents the spirit of PSRW. We know there are inspirational, empowering, and exciting stories of Federal employees just waiting to be told. And we’re counting on you to share them. On Monday, I’ll ask five Federal employees who represent the spirit of Public Service Recognition Week to join me on the field as I make my major league baseball debut. Follow me on Twitter, Instagram and Facebook through @OPMDirector for updates. I can’t wait to hear the #FEDSpirit stories you have to share. Today we take a moment to step away from our busy lives to remember the life and sacrifices of the Rev. Dr. Martin Luther King Jr. It’s a day for the nation to honor the legacy and spirit of this civil rights giant. In his proclamation designating Jan. 20 as the MLK Federal holiday, President Obama urges Americans to come together for a day of service. “By volunteering our time and energy, we can build stronger, healthier, more resilient communities. Today, let us put aside our narrow ambitions, lift up one another, and march a little closer to the Nation Dr. King envisioned,” the president said in his proclamation. I hope all Federal employees, each in our own way, will celebrate Dr. King’s life through an act of service to neighbors, friends and people in their communities who are in need of a helping hand. This is what Federal workers do: serve the people of this great country. Enjoy this holiday. And make it a “day on” not just a day off. I love visiting with Federal workers! This past week I had the special opportunity to travel to Ft. Meade, Maryland to meet and share donuts and coffee with some dedicated OPM employees from our agency’s Federal Investigative Office and the Office of the Chief Information Officer (OCIO). I met such talented and engaged employees like Elaine Bosserman, who has been at OPM for 8 of the 12 years she’s worked for the Federal government. Elaine is a FIS investigative case analyst who evaluates personnel security and suitability background investigations to make sure they meet our national security and quality standards. And I visited with Cassandra, who has served her country as a Federal employee for 33 years. For the past 8 years, Cassandra has supported OPM’s mission by overseeing a team that performs a number of record checks in connection with FIS background investigations. My trip to Ft. Meade was my first visit in 2014 with OPM employees in the field, but it won’t be my last. One of my highest priorities as Director of OPM is to be a champion of Federal employees all across this great country. And I hope to carry that message personally to as many people in our Federal family as I can.